Send me an email when the BlueJacket is available please! 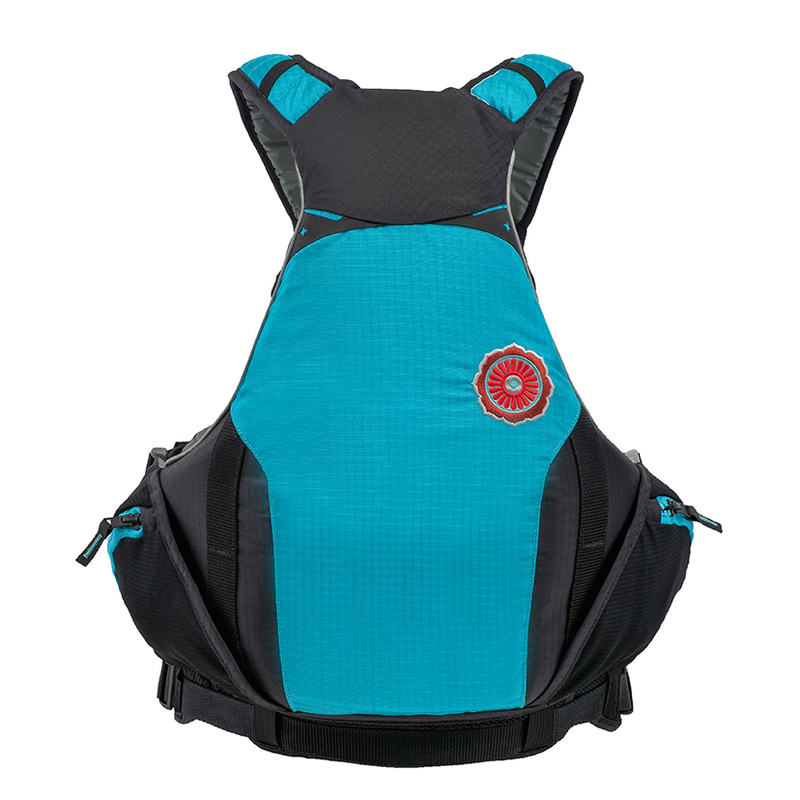 A two-panel fit system designed to eliminate ride-up and allow for maximum mobility. Adjustable torso height provides a custom fit. 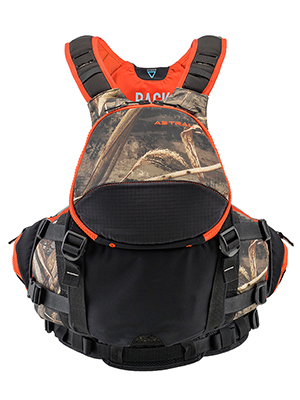 The coolest and most comfortable PFD around! 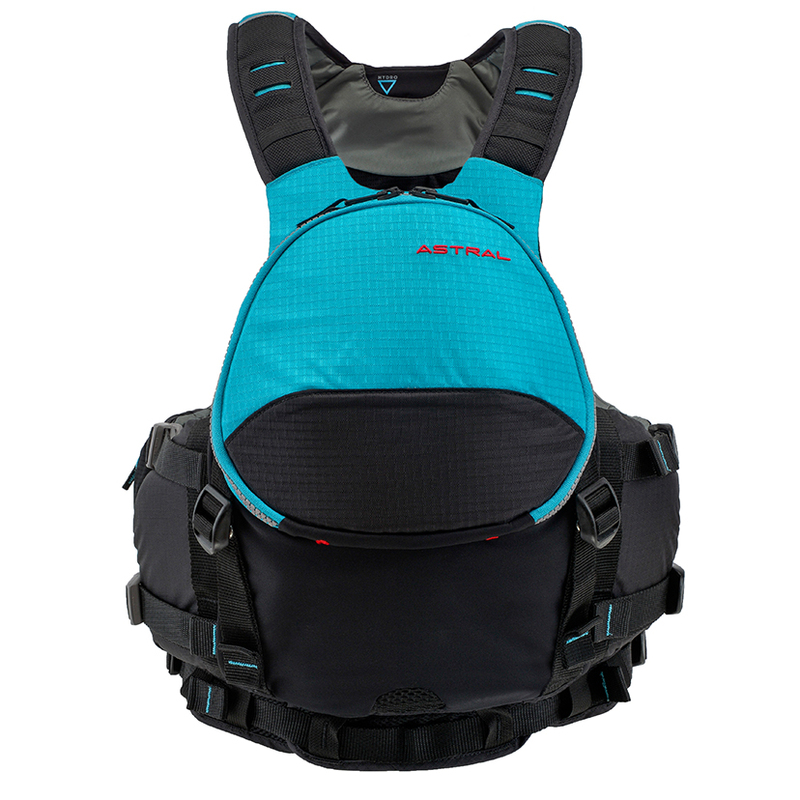 If you like arm freedom of movement and minimal feel in a PFD, this is a great one. I am also really in love with the clam shell pocket, except for one thing--it needs a couple places with D rings or loops inside of it to attach keys or miscellaneous small stuff that you don't want falling out. It does have 2 larger zippered pockets but could use more tie down loops IMO. I like how the spine is protected fairly high in the back, unlike a lot of freestyle vests. Easy to put on over the head, light weight, and floats really high. I thought the pocket in front would get in the way since it does have a presence but there was no issue rolling or leaning forward. Love the blue color too. Works really well for the less endowed lady; I found the Layla to not work for my less than robust upper body. Equally at home rowing a raft or kayaking and I love the softness of the Kapok foam and actually wish the whole thing was made of it but it does not feel stiff or rigid like a lot of PFDs because of the contoured hinged panels. I am pretty excited to be using this awesome PFD! Thanks, Astral! For those of you looking for an upgrade from the Sea Wolf, search no more. 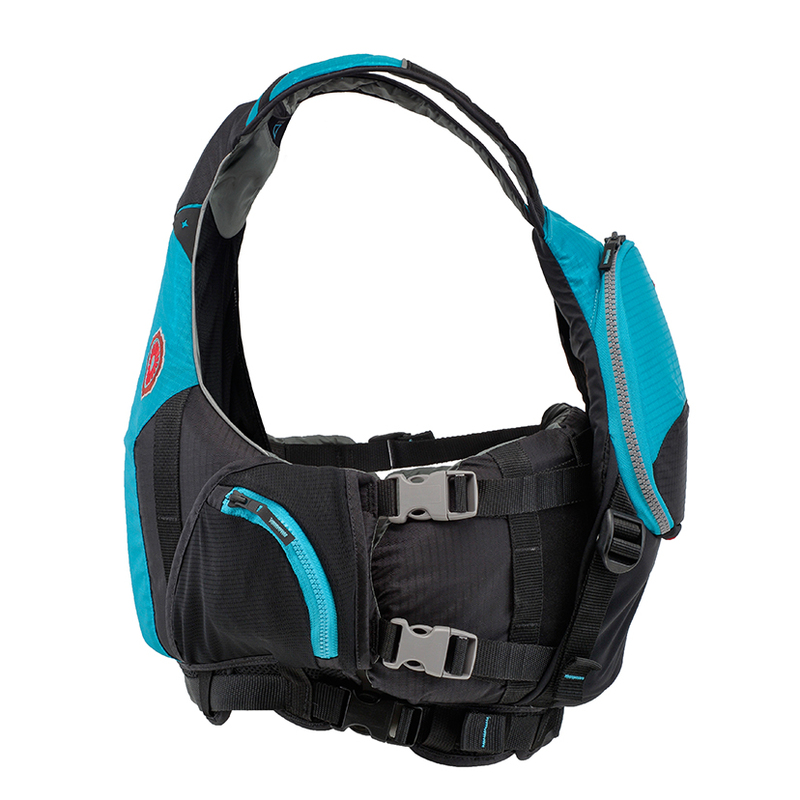 The Sea Wolf was already a really good PFD with tons of features and packed with safety and rescue in mind. The Blue Jacket is simply a revised version that replaces the Sea Wolf. All the things you loved about the Sea Wolf with some really great upgrades. The clam shell pocket is similar to that of the Green jacket. Its very versatile. The pocket has two top opening by the shoulder straps allowing for a VHF antenna to stick out while the radio is well protected inside the clam shell. Two additional zipper pockets inside the clam shell allow for small notebooks and repair tape. I also keep a vinyl emergency hatch cover in there. In short, the clam shell area is a total upgrade to what was a great design to begin with! The water bladder hooks on the back of the jacket are more robust and easier to reach. I am not a fan of the lose straps once you adjusted the vest. Now the straps have velcro which keeps them out of the way at all times. 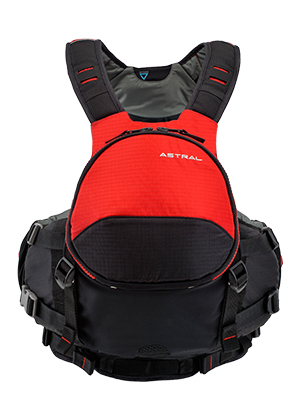 The shoulder straps have a really robust slash tabs along with elastic straps giving you even more options to attach your favorite accessories like knife, flash light, carbines or whistles to name a few. When I was done accessorizing the jacket and headed to the water, the jacket did feel just as comfortable as the old Sea Wolf but I had all the items I needed more easily available. Including my old web tow with belt from my old jacket which is fully compatible with this new upgraded design. The two additional side pockets are still one of my favorite features. Not only great to keep the short web two out of the way, it still fits a small first aid, snack and for some of us, spare contact lenses! This jacket allows you to bring everything you want and need without compromising comfort. You will notice I use the work UPGRADE often in my review. Thats because I dont have enough words to properly describe how great is the Blue Jacket. If you loved the Sea Wolf, there is no reason you will love the Blue Jacket much, MUCH more. I used to be excited about the boats I paddled, but now I have to share that excitement with the life vest I use. 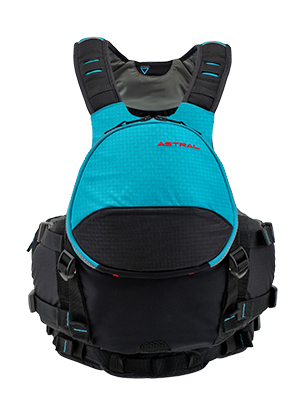 Astral Blue Vest, first impressions. Just purchased the Astral Blue Jacket and wanted to provide my first "out of the box" impressions. 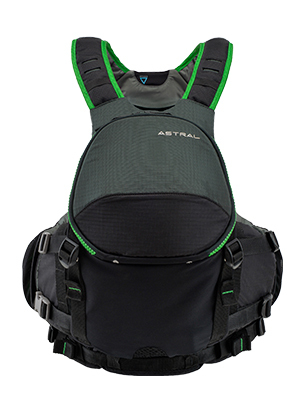 I know the vest shares a lot of features with its sister "green" vest and I appreciate many of the features carried over into a more sea kayak specific vest. First, the fit and finish of the vest is excellent, the quality is high. I had high expectations given Astral's reputation and having a dotted line connection to Lotus Designs. I havent seen their sea wolf jacket to compare upgrades to the blue jacket. In purchasing this vest I had a couple of goals. As an ACA instructor, I wanted a vest that was tow compatible. I wanted a vest with more storage than my current 10 yr. old Lotus Designs vest. I wanted a vest that could easily store and quickly retrieve my vhf radio. Lastly, I wanted to support an USA company that caters to paddlers. Once I got my hands on the vest I was surprised at a few things related to the clam shell pouch. There is probably enough storage and pockets for items, but I think the inside could have been better designed and Ill explain. I thought there should be an extra D-ring or two sewn into the internal pocket. There is one located inside a zippered pocket, but if youre like me, most everything is tethered to my vest so it doesnt end up in the drink: knife, whistle, Lendal hex key, vhf, car keys, etc. An additional, centered d-ring would have accommodated these items better. The Blue jacket does allow for a vhf radio antenna to exit the clam shell pocket out near the shoulder strap, but I found it nearly impossible to insert the radio into the internal pocket for storage. The front lip of the internal pockets are sewn and not elastic so there is no give when trying to quickly insert or retrieve the radio. It was difficult attempting when holding the jacket and nearly impossibly when wearing. Even when I try to clip the radio to the lip of a pocket, again the pocket lip it too high to clip and insert the antenna out the port hole. Maybe this pocket could have been cut lower, been elastic, or maybe another loop of webbing could have been sewn to accommodate different sized radios. Maybe a strap of Velcro could have better accommodated different sized radios? My solutions in retrofitting were inserting a strap of webbing through the horizontal pocket inside the clam shell. This allowed me to attach a couple of ring attachment points and still store my knife horizontally. I can now easily attach my multiple lanyard items. For my radio, I was able to attach a carabiner to the fabric that attaches the clam shell pocket to the vest and with some elastic line, tie a quick release loop. Now Im able to store my vhf securely, retrieve and store it quickly. When the clam shell is zippered everything is stored securely, sleekly and I dont even know its there. For sea kayakers, I think Astral could address the vhf radio issue in a way that better accommodates this important safety feature. This is my first tow compatible vest, I really like how the tow belt attaches to the vest and where the quick release toggle sits. I can quickly release from the assisted boater. One item I wanted to point out is that if a rescuer wanted to transfer the complete tow system to another boater, you cant if you thread the webbing through the quick release buckle side of the vest. This is not an issue if everyone in your party has a tow system. It will work if you dont thread the belt webbing through the vest on the quick release buckle side and just run the belt through the sleeve behind either of the two side pockets. Ill play with it in the spring and see how it tugs. I will put this vest through its paces this summer teaching and paddling and Im sure it will hold up to lots of abuse. With a few self-modifications, Ive made some improvements on an already nice vest.